Need to sell fast for cash? Who are the best ‘We buy any house’ companies. How to get a better offer from a ‘Quick Sale’ company. How to spot (and avoid) the scams that rob you of £1,000’s. Do you really need to sell to a fast cash home buyer? How quickly can these companies buy my house? Are there any other costs to expect? There are 100’s of companies and websites all claiming they can buy your property fast for cash. However, only a handful are ’genuine‘ cash buyers, pay fair prices, and have the ability to quickly solve whatever property related problem you’re facing. Sadly, most ‘Quick Sale’ companies have shown us they’re not to be trusted. A favourite trick is to reduce the agreed offer price at the 11th hour (just when you’re all packed and ready to move). …But then cut you back savagely when you’re out of time and unable to do anything other than accept. There are decent home buying companies out there that won’t reduce their offer at the last minute. So be sure to use our free & impartial recommendation service to find out which ones are best for you. TheAdvisory is written and contributed to by property professionals from inside the UK House Building, Developer Part Exchange and Asset Management industries (see our about page). We’ve unofficially monitored the ‘Quick Sale’ industry since 2005, and because of our involvement in the property market, had direct experience in dealing with 99% of the reputable ‘fast cash for property’ firms currently operating in the UK. We mystery shop all the main cash house buying companies (and any new entrants) quarterly. 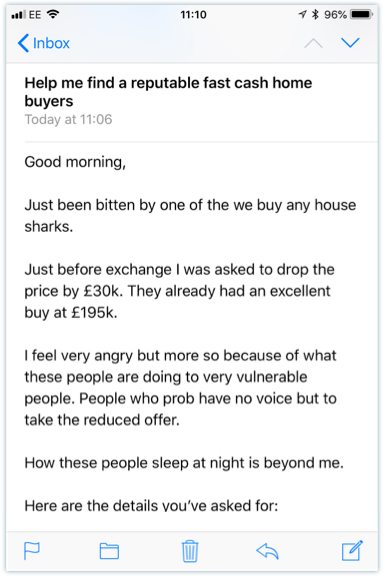 We continually collect feedback and reviews (both positive & negative) from houses sellers using these companies – this keeps our finger on the pulse of who is (and isn’t) providing a fair service. 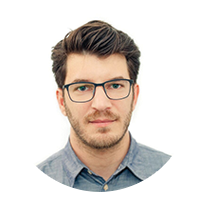 Our recommendations will make sure you avoid being ripped off, and successfully sell within the timeframe you require, at the best possible price. Why provide this FREE service? The ‘Quick Sale’ industry is not regulated (although it should be), and so we provide this FREE service to help protect the public from the rogue element that exists within this sector. Are our recommendations respected and any good? Because of our involvement in the residential property sector, we know (and have dealt with) 99% of the reputable ‘quick sale’ companies. I’m happy to recommend which company will pay you the highest price and best suit your situation and needs. 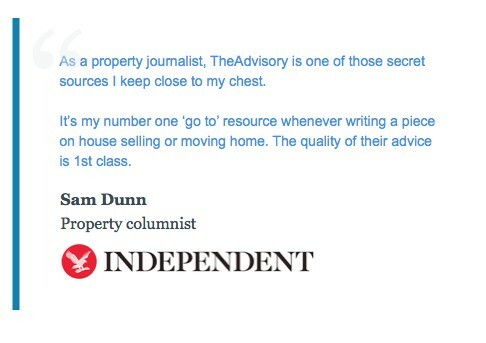 Because all buyers have different buying criteria, if you want a FREE recommendation, simply email me at info@theadvisory.co.uk with some basic details about your situation and needs. Realistic value of the property? Why you need to sell fast? “I promise to provide a ‘same day’ response (either by email or phone) in helping you identify the most suitable cash buying company for you. To request FREE help finding a reputable cash house buyer, send me the above information in an email to info@theadvisory.co.uk. This is a 100% private & confidential service! Please rest assured that we hate SPAM just as much as you. TheAdvisory is here to provide you with helpful information and to steer you away from the rogue cash homebuyers that plague this industry. Any contact we have will be held in the strictest confidence. Then (and only then) should you explore this method of sale! A reputable and professional cash homebuyer will be able to buy your house and put cash in your bank account within 7 – 28 days. Many claim they can do this in 24 hrs but in reality there are only one or two specialists that have the resources to make this happen. If you have the misfortune to end up dealing with a less than genuine buyer, expect the process to be drawn out for months as they try to secure mortgage finance. For your sale to stand a chance of meeting whatever timeframe you stipulate, your buyer has to be genuinely cash funded. Be aware that 99% of the companies out there are not ‘genuine’ cash buyers. Although their websites may suggest otherwise, the vast majority of these firms are lead generators selling your personal details or brokers passing your details on to small-time investors. This second group predominantly need mortgage finance and/or tie you in with option contracts. The option contract is needed to hold you in place (i.e. stop you being able to sell elsewhere) while a buyer and/or mortgage funding is secured. This makes the process risky and your sale far from guaranteed. From our research, we estimate that in fact over 70% of sales agreed to these types of buyers fail, because mortgage funding cannot be secured. In other words, a massive waste of your time. When you speak to them, these companies will claim they pay ‘up to’ 85% or 90% of your home’s open market value. Some even say they pay ‘up to’ 100%. The words ‘up to’ are deliberately chosen to mislead. Top Tip: If anyone makes a claim that sounds too good to be true…it is! We’ve observed 1,000’s of quick sales and 99.99% of them have gone through at 75%-82% of a conservative estimate of open market value. In fact, any offer above 82% should be treated with a certain amount of suspicion. Anyone claiming to pay 85%, 90%, 95%, 100% is NOT offering a ‘guaranteed‘ cash purchase of your property. They are offering to ‘sell’ your property (not to ‘buy’ it). We realise that’s confusing. Sadly there are many ‘peddlers of false promises’ out there. Of course, there are no guarantees when it comes to selling via estate agents. Never the less, the question above does encourage them to give a more considered estimate of open market value (as opposed to the usual deliberate overvaluation used to impress and win new clients). Bottom line: Quick cash house buyers provide a service – one that gives you a certain and speedy sale. As you are no doubt aware, certainty and speed are rare commodities when selling property. This is why you have to pay for them by accepting a discounted sale price (usually 18-20% below market value). The reputable firms we’ve identified in the market do not charge any fees, and most also pay your legal fees (although that is deducted from their offer price). …There are a number of organisations that will make you a verbal offer, but then insist you pay an inflated price for their surveyor’s valuation (anywhere from £200 – £600) before they’ll put an offer in writing. They will usually phrase it as a ‘refundable payment for valuation’ which sounds fine – it’s ‘refundable’ after all. However, because the money is only refunded if you accept their offer, this system is wide open to abuse. Companies can pocket a quick £200 by making you a strong verbal offer and then lowering it after you’ve paid for the valuation. Do that a couple of times a day and you have a business that doesn’t even need to buy any property to be profitable. We highly recommend you steer clear of any home buying service that asks for an upfront payment of any kind. When someone needs to sell a house fast, it’s normally because they’re in a bit of a fix. There are some excellent companies out there providing a transparent and valuable service, however there are also a fair few people just waiting to take advantage of your situation. Stick to these 6 simple rules, you’ll be able to identify a reputable provider and sell safely. Ignore them and you’re in real danger of coming a cropper. #1. If they ask for any upfront payment of any kind – WALK AWAY! #2. If they can not provide ‘proof of cash funds’ upon your request – WALK AWAY! #3. If they will not provide contact details of recent clients (so you can ascertain customer service levels) – WALK AWAY! #4. If they claim to provide a guaranteed sale within 28 days for close to full market value – WALK AWAY! #5. If they claim they (or the industry) are ‘regulated’ – WALK AWAY! #6. If they ask you to sign a ‘lock-in contract’, ‘option agreement’ or ‘RX1’ form – WALK AWAY! This last rule (rule #6) is the most important as it is your insurance against any attempted dirty tricks (leading up to the completion of the deal) as it leaves you able to walk away at anytime. We can’t stress this enough – Do not sign any type of lock-in contract or option agreement without first speaking to a solicitor. A reputable firm will not ask you to sign anything except a standard contract of sale just before exchange of contracts (just as with a traditional house sale) & possibly a form stating you’re happy for them to carry out money laundering checks on you. TheAdvisory is written and contributed to by property professionals from insider the UK Homebuilding, Developer Part Exchange & Asset Management industries. Because of our involvement in the residential property sector, we know (and have dealt with) 99% of the reputable ‘quick sale’ companies currently operating in the UK. We are happy to recommend which ones are; safe to use, DO NOT charge any fees, DO NOT use option contract and best suit your situation and needs. Thank you very much for your guidance. This is going to be really helpful. We will be sure to let you know how we get on with the companies you have recommended. Hi Gavin. Thanks for all your help and advice about selling my home, but we’ve finally sold for £135,000 to first time buyers! We dropped the price quite a way from the original £150,000, but we’re happy with the outcome. Your honest words were much appreciated and I will recommend your website to people and certainly use the site myself again in the future no doubt. Thank you for your reply to my e-mails. Your guide is absolutely brilliant and if everyone who wishes to sell their home in this manner follows the excellent information contained in the guide, they should never make a mistake get into trouble. I got in touch with you on behalf of my mother and I have to say that we are sincerely grateful for your help. She is not yet at the crisis point where we need to sell the house for cash but a few months down the line she will be running out of money and may need to use this option. I had heard that selling your house for cash could be a con and so just wanted to research for myself to see how risky it is, if she gets to that point. I have to say that Ben Ellis whom you recommended to us diminished all of our fears completely. He was not pushy at all, caring about my moms position and most of all upfront and realistic about the price she would expect to get. My mother was terrified at the thought of being ripped off but after speaking to Mr Ellis she is relieved that if we can’t sell the house ( due to the slow market) she has a safe back up plan. He made her feel completely at ease and said that if she wanted to ring him and ask anything she could. He’s a nice man, my mother was very impressed with his attitude. I can’t believe that a site like yours exists, for free. You have saved us from a potential nightmare, as my mother was considering choosing someone out of the paper to come down for a valuation, out of curiosity. The problem being that they would have told her such a high price that she would have snatched their hand off. Thanks for all that you say on your website, it’s been a godsend. We have read every word and used a lot of the information. Some tricks we had already used but this site confirmed that we had done the right thing. I have to admit, it is great to finally find some impartial advice on this because (as you say) there are an awful lot of shady characters out there!! thanks for your advice and time. I did speak with Jamie Moodie yesterday. I am usually sceptical about speaking to anyone who is looking to rip you off, and after reading your site yesterday, I was extra vigilant! However, I may have had the wool pulled over my eyes, but Jamie seemed geniune. Infact I think that more so as he wasn’t pushy, and offered advice rather than take the bite. I appreciated his conversation, and if I need to go down that route would feel that I could trust him. I don’t know if you can help – I hope so as I am desperate ! I am a full time carer and live with the person I care for an her mother. I have recently become disabled too and we desperately need to move as we live in a town house (3 floors) and the stairs are a problem. The person I care for has a mental illness and any change or uncertainty cause great distress. Her mother is 73 years old and struggles to cope with things at times. We need to find someone who can help with the selling of our property and the purchase of another to make it as stress free as is possible. Hi Gavin. Thanks very much, very informative indeed! Although alot is common sense, I must admit I wouldn’t have thought of many of the points you raised. I would be interested to know if you have heard of a company called Jack Property? Thank you so much for your help/advice it is much appreciated! Dear Mr Bragz. Thank you for your help. Many thanks for all the advice you have given. It will certainly help us to make an informed decision.